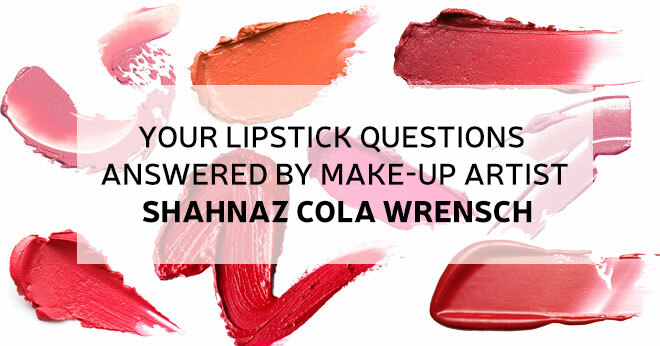 Professional make-up artist Shahnaz Cola-Wrensch knows a thing or two about lipstick. Here, she answers a few of the questions submitted by you, our lovely BeautySouthAfrica readers. In terms of lipsticks, I haven’t found one that lasts all day. Some of them claim 14 hours, and these leave a stain but they don’t last all day and can dry out your lips. I personally love MAC Ruby Woo and Russian Red for a matte lip, but if you have a dark lipstick you love you can create your own matte lip. Firstly you need to exfoliate your lips to make sure there is no excess dry skin, then apply a lip balm that isn’t shiny. Apply a lip liner to trace the outline of the lips and to ensure your lipstick doesn’t bleed. Then apply two to three layers of the lipstick and in between each layer, take a tissue and press lips down on it, and then reapply the colour. When you have done your third layer, apply translucent finishing powder with your fingers to set your lipstick and create a matte lip. If you want your lipstick to last longer, the key is prepping your lips first. Exfoliation is one of the most important steps. A lot of the time our lips are dry so you need to get rid of the dead skin and smooth out the lips. Either invest in a lip exfoliator, or create one yourself using olive oil and sugar. Make sure lips are hydrated by applying a lip balm like Carmex before applying your lipstick. You can opt for a long wearing lipstick – there are a few budget options out there. However, you can create it yourself by applying a translucent finishing powder to lips that have been coated with two to three layers of colour. Take a tissue in between each lip application and press lips onto paper, then reapply. This will make sure your lipstick is really set. The powder can be applied with your fingertips or with a brush. The best lipgloss colours for dark skins are shades like fuchsia pink, bright and deep red, plum, berry, purples, darker nudes and corals. Girls with dark skin can get away with bright colours and darker shades. Stay away from shades like frosty pinks. What’s the best lip shade for olive skin tones? Thank you so much for this article, question one has helped me a lot as well. The tip about the tissue and powder works like a charm, and I love it to bits and pieces. Thank you so much! This was extrememly helpful as I wear lipstick on a weekly basis. I’ve been trying to find a way to get my lipstick to last longer, and I’m so glad you mentioned exfoliation. I’m definitely going to start doing that and see the results. Thank you for lipstick advice. I found the tip about taking a tissue and pressing your lips between each application (three layers were recommended) most enlightening and I look forward to trying it out! Thanks for the tips, this will help a lot. Thanks for the powder tip. How often should one exfoliate their lips? The tip with the powder does work. I also love MAC Ruby Woo for that beautiful red matte lip. I just make sure I exfoliate gently and generously apply Blistex DCT, leave on for a few minutes and blot off the excess before I apply my lipstick. That way, I’m sure that my lips are moisturised enough to handle the dry lippie. Thanks for the tips on making your lipstick last longer. I love matte these days and this will help out a lot. Great tips! Thank you. I was also looking for a dark red matte lipstick. Thank you for the lip colour recommendations. I know finding the perfect lip colour (for any skin tone) is trial and error, but having a few recommendations helps as a starting point. Best to make your own lip exfoliater and you wont worry about running out of any.